2011 second-round pick, Colin Kaepernick, was a successful quarterback (even leading the 49ers to their first super bowl appearance since 1994)–however, in 2016, that all changed. In a form of protest, Kaepernick took a knee during the National Anthem to bring attention to the racial inequality happening in America. Though he gained positive reactions and inspired men, women, and children of all ages, the negative reactions were too consequential. Some saw his advocating as inspiring, brave, courageous–others, not so much. He received backlash through social media across all platforms from other athletes, politicians, and just about every other group. Following his season of protest, Kaepernick became a free agent; whether or not his NFL career is officially over is still up for debate. Although Kaepernick’s protest swept the nation and became the talk of the town for weeks, months, even years–eventually it began to die down, just like any other story. However–that was not the end of Kaepernick and his devotion to activism. On September 3rd, 2018, Kaepernick tweeted out the new Nike ad, that says, “Believe in something. Even if it mean sacrificing everything.” All the attention that seemingly had been forgotten, had been placed back on him and 30th anniversary ad for Nike. 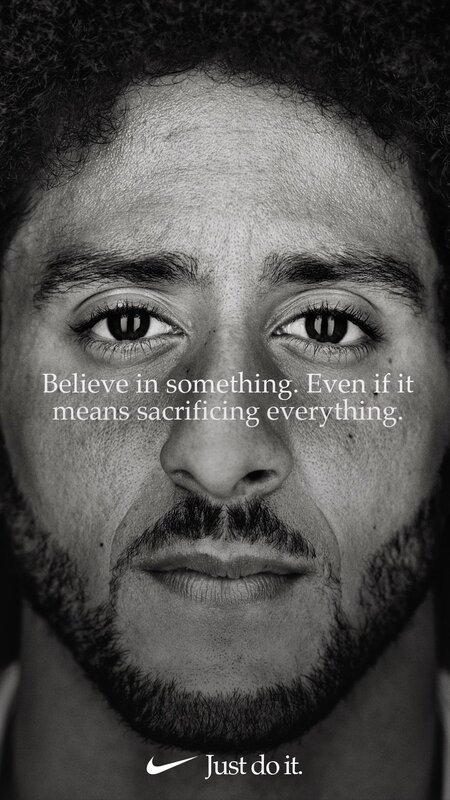 In a matter of seconds the ad had gone viral, being shared across Instagram, Twitter, Facebook, even Snapchat had made a new filter with the quote on it–Kaepernick was back in the spotlight. As soon as the ad surfaced, so did the millions of responses regarding Kaepernick being the new face of Nike, with some claiming to never buy their products again, others throwing theirs away, and some even burning their Nike belongings. Not only were products being tarnished, but stock prices began to plummet–all due to an ad, featuring a man who wanted social justice. That brings us to the question of, is this continuous backlash simply because he took a knee during the National Anthem, or is the underlying reason related to race? After all, Kaepernick was not disrespecting our flag, or anthem, but instead trying to bring awareness to the social injustices happening within the country.